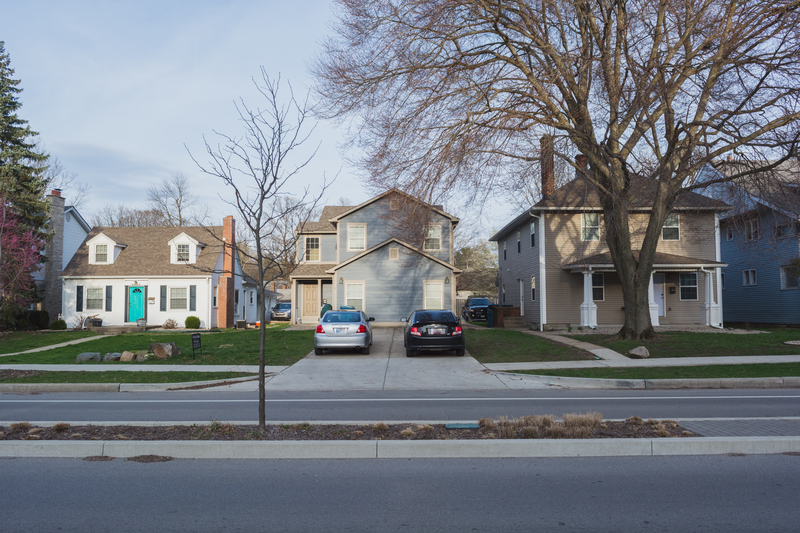 A row of potential off-campus houses sit along Sunset Boulevard, bordering Butler’s campus. Photo by Adam Cvik. Next year juniors will not have the opportunity to live off campus. Sophomore students received an email on Sept. 5 regarding off-campus housing for the 2018-19 school year. The email said off-campus housing was not allowed for the following year, unless the student is at senior standing with 91 or more credits completed. The email from Residence Life said Butler University will have adequate housing available for juniors. Doug Howell, associate director for Residence Life, sent the email because he received many questions from sophomore students asking about living off campus their junior year. This year is an exception to the residency requirement. Juniors were allowed to live off campus due to a large number of students, specifically the class of 2020, who filled the residence halls to capacity. This forced many juniors to find alternative housing. Juniors were allowed to live off campus until Butler changed the residency requirement in 2006. Junior students can live in Apartment Village, CTS, Butler Terrace, University Terrace or a Greek house. Courtney Rooker, junior communication sciences and disorders major, lives in a house off campus. She applied to live off campus last year after the option was offered to sophomores. Rooker said the transition from living with many women in a sorority, Alpha Chi Omega, to five other women in a house prepared her for living off campus. The seven-bedroom house costs Rooker around $600 per month in rent and fees. Five other women live with her in the house, and there is one available guest room. This is the first time Rooker has had a room to herself. She could not live in her sorority’s house, but Rooker has a meal plan with her sorority to save time and money. “Living off campus has taught me how to be more financially responsible,” she said. Howell said Residence Life will not know the housing intention for next year until March. Changes depend on students who study abroad, live in Greek houses or commute from home. “There are a lot of variables that play into effect,” Howell said. Howell said Residence Life will reevaluate after spring break if off-campus housing is necessary, but more than likely it will not due to the new residence hall. Sophomore students have also received emails from landlords about housing for the 2019-2020 school year, but the Division of Student Affairs suggests sophomores wait to sign leases. The Division of Student Affairs sent an email to students regarding senior houses and leasing. Landlord Scott Jacobson rents eight houses close to campus to Butler students. Jacobson is an independent realtor who is not affiliated with Butler. He has rented to students for 14 to 15 years. Only one group of sophomore students has contacted Jacobson about renting their junior year. He is not currently renting to any juniors, but would in the future. The Student Affairs email reminds students of housing options for seniors on campus: AV, CTS, BT and UT. Howell said around 10 percent of seniors live on campus. Howell said Butler bundles costs of living together for housing, security and proximity, while off-campus houses often include fees and may be farther away from campus. Rooker said the Butler residency requirement to include juniors on campus is a good idea. Howell said Butler’s residency requirement will probably not change in the future.